The ER815 C4D Detector is a high sensitivity capacitively-coupled contactless conductivity detector (C4D). This single channel system can be used for capillary electrophoresis, microchip electrophoresis, ion chromatography/HPLC, flow injection analysis and novel applications. The excitation frequency and amplitude can be optimised by the user for maximum signal sensitivity. The unit must be used together with an eDAQ C4D headstage suitable for your application. ER815R: includes PowerChrom software, for capillary electrophoresis, microchip electrophoresis and chromatography-type applications. ER815C: includes Chart software, for flow injection analysis and conductivity monitoring applications. ER815: for people wishing to use third-party software to record the data. This includes ChemStation from Agilent, 32 Karat from Beckman Coulter and LabVIEW (using the virtual serial interface over USB connection to computer). In this configuration, the ER815 provides both analog and serial data output. Users can change the configuration of their ER815 themselves at any time, from using eDAQ software to third-party software or vice-versa, using the ER8x5 Converter and Updater software. The product comes with the following software included: C4D Profiler V2 (to optimise the settings), C4D Configurator (to select the settings) and ER8x5 Converter and Updater (to change the firmware). 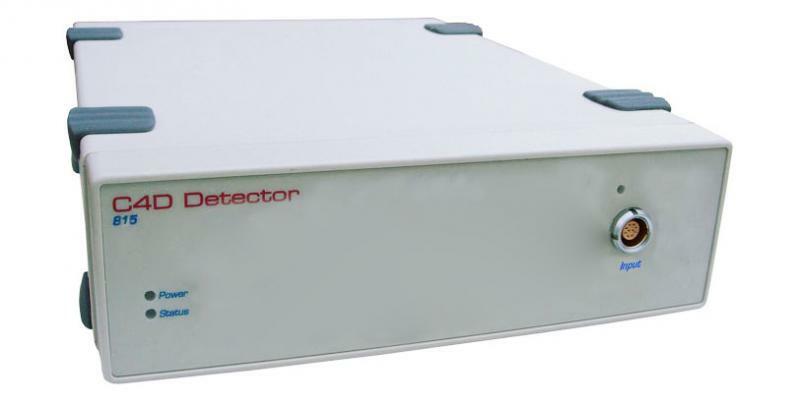 The ER825 C4D Detector is a multi-channel version of the single-channel ER815. The ER825 can record the conductivity at up to eight positions on a capillary or tubing. The optimum excitation frequency and amplitude can be measured using the C4D Profiler V2 software. - When serial firmware is installed: use C4D Configurator software. - When applications firmware is installed: use the option in PowerChrom or Chart software. The firmware can be changed by the user at any time, between serial firmware (signal recorded in third-party software) and applications firmware (signal recorded in eDAQ software), using the ER8x5 Converter and Updater software. eDAQ reserves the right to alter these specifications at any time.